SA announced on Monday that rapper A Boogie Wit Da Hoodie will be a co-headliner at this year's Spring Fest. Spring Fest 2019 is set. The Student Association announced co-headliners A Boogie Wit Da Hoodie and Lil Baby and opener Rich the Kid as performers on Monday. This year’s performers deviate from the concerts in the Fall Fest Concert Series, with only rap artists featured on the bill so far. SA indicated on social media that it will release “more artists” before the show date. The location is to be announced. Undergraduate students who pay the $104.75 mandatory student activity fee can attend the concert if they reserve a ticket starting April 16 at 10 a.m. on SA’s website. SA President Gunnar Haberl said Spring Fest will be back in its traditional format after last semester’s trial of the Fall Fest Concert Series. Lil Baby had the second-highest student submissions (51) in SA’s survey, trailing just behind Post Malone (55) in the “first-choice” category. The rapper was the top choice in the “second-choice” category with 40 submissions. A Boogie received 22 student submissions in the first-choice category and 15 in the second. Opener Rich the Kid recently released his debut album “The World is Yours” in 2018. The album found favorable reviews and reception, peaking at No. 2 on the Billboard 200. Students have mixed, but generally positive, reactions to the announcement. Morgan Digangi, a senior graphic design major, is excited about the lineup and said she is looking forward to seeing Lil Baby and Rich the Kid. “I’ve just recently started really getting into [Lil Baby’s] music and he’s grown on me a lot. Rich the Kid has always been one of my favorites, so I’m definitely the most excited to see him,” Digangi said. Digangi said she was waiting for the announcement all semester and enjoyed the hints SA tweeted out before the lineup announcement. Aissata Barry, a junior philosophy major, said she is especially excited to see A Boogie Wit Da Hoodie because they share the same hometown. Other students were disappointed with the lineup. Thomas Andrews, a freshman media studies major, said he was hoping for a genre variety. Andrews said he would love to see more classic rock artists featured in future Spring Fest lineups. Though SA revealed the lineup on social media, some students were still unaware of the announcement. Gabby Nolan, a geology major, thought SA should make more of an effort with announcements outside of social media. SA has yet to announce a final location for Spring Fest. 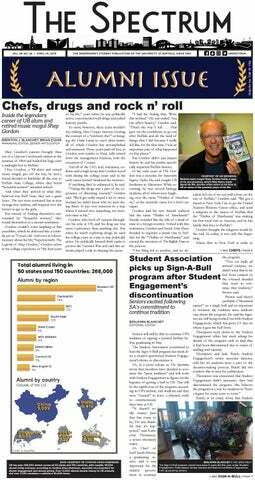 Brian Evans and Julianna Tracey are arts editors and can be reached at arts@ubspectrum.com.